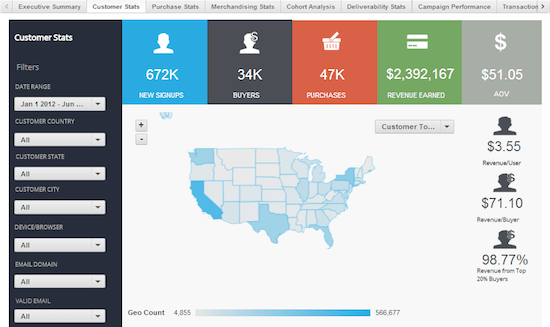 After months of stealth beta testing with Sailthru clients, like Country Outfitters and ScoreBig, we’re pleased to announce the launch of Sailthru Advanced Analytics — a new multichannel business intelligence tool enabling marketers to explore the long-term impact of every brand interaction that, ultimately, transforms consumer experiences and increases customer lifetime value. What is Sailthru Advanced Analytics? ● Multichannel marketing analytics management: Built on Sailthru’s customer profiles, Sailthru Advanced Analytics equips marketers to quickly interpret 360-degree customer metrics, making this the most powerful marketing BI tool on the market. ● Smarter marketing tactics: Leverage complex cohort analysis and market basket assessment to identify engagement and cross-sell opportunities. ● Slice and dice data: Sailthru Advanced Analytics’ custom data cube enables clients to drill several levels down into metrics and reports with sophisticated visualization. ● Focused insights for stakeholders: Pre-loaded dashboards provide vital insights differentiated by department. These include acquisition campaign performance and merchandising statistics among others. ● Predict long-term impact of decisions: Clients can now easily compare near-term conversion data with lifetime value measures. 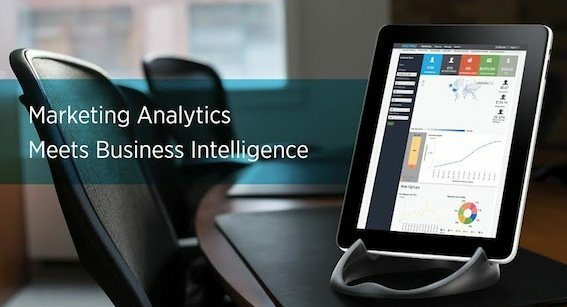 In short: think business intelligence meets marketing analytics meets flexible, personalized reports. Everyone in your company — whether a C-level executive or a Marketing Manager — can use Sailthru Advanced Analytics to drill down into their areas of interest, and produce beautiful, digestible data visualizations with ease. Per Forrester data, organizations’ number one software priority since 2010 has been business intelligence, year over year. The truth is there is a LOT of data out there. But what marketers and businesses are interested in are true insights and information you can take action on. Sailthru Advanced Analytics makes sense of the staggering amounts of data sets you have so you can become strategic in driving revenue and success. It’s not meant to be a substitute for data scientists, but it is like bringing another data scientist on board…who can crunch numbers at astounding rates. And the absolute best part? It’s not an extra piece of technology to manage and worry about. Sailthru Advanced Analytics works seamlessly with the core Sailthru suite to keep all of your data (and sanity) under one roof. How is it different from Sailthru UI reporting? While Sailthru clients have enjoyed many reporting features in the UI, it’s important for us to distinguish how the existing UI reporting is different from Sailthru Advanced Analytics, and that they actually work together to help you deliver the best ROI. Sailthru UI reporting focuses primarily on real-time performance reporting, which is great for measuring the success of your campaigns, but not for a full scope into your business. Sailthru Advanced Analytics uses cohort analysis, a sophisticated amalgamation of multidimensional, historical data across different cohorts to fully customize analysis, and easily compare and contrast reports. This is critical in identifying those behavior trends of your customers to effectively test and optimize your operations. You can also precisely create and measure custom metrics that matter to your particular business. Using the multidimensional data cube tool, you can drill down to the most granular data points relevant to your unique business. Every business is different, so your analytics should be too. 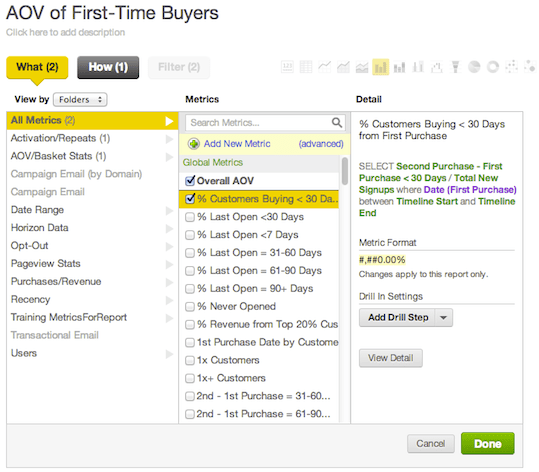 Finally put the metrics that are mission critical to your company’s success front and center. Ready to get started? Contact our Sales team today. To learn more about the power of Sailthru Advanced Analytics, our data evangelist Cassie Lancellotti-Young will be hosting the webinar, “Transform Customer Experiences with Sailthru Advanced Analytics” to give you a deep dive into the platform with custom examples, and an exclusive tour of the interface.